It's an enjoyable read. I love how she weaves helpful information into entertaining stories and notes from the road. The book is a great mix of practical with inspirational, all told in a friendly story. Reading the book felt like meeting a well-traveled friend for coffee. In fact, you'll feel like part of her family. It's encouraging. There were several times I found myself a bit emotional while reading this. She strongly believes (and I concur) that travel will make you a better parent. I savored hearing about her family’s perfect ending to their Paris trip (particularly in light of having to cancel our trip to Paris, which I'll write about later this week). Her family shares my family's love of nature, so I was moved by her story of their interaction with manatees on a trip to Florida. And she'll even tell you to give yourself a break once in a while. As she writes, the travel police won't lock you up for feeding the kids cereal for dinner once in a while. It's respectful. 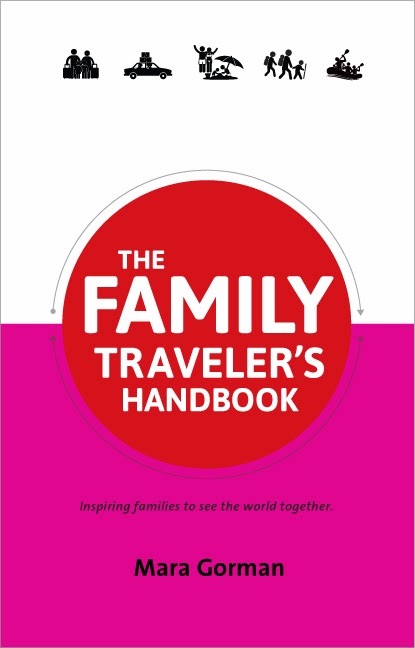 When it comes to travel, there's a different style for everyone (much like parenting itself). I always get a bit peeved when some travelers dismiss the resort-types, or the amusement park lovers, or the campers. This book will appeal to travelers of all kinds, and Mara will even give you some tips for finding out which styles might best suit your whole family. And while she's been to several countries and most of the U.S. with her family, she holds as much value in the day trip an hour away as she does the bucket list trips to Europe that families spend years saving for. There's something for everyone in this book. Most importantly, it's helpful. She weaves many great tips into the narrative of this book. Her advice ranges from broad topics such as figuring out where to stay, down to the nitty gritty like how to avoid cluttering up your inbox with travel deals. Many of the things I learned on the fly through trial and error over the last four years could be gathered in one afternoon of reading. In fact, it's the perfect entry point for a mom-to-be who wonders if her travel days are over. It's a great read for the mom or dad who has a few overnights under their belt, but longs for more. And it is still very much applicable to the seasoned travelers. I like to think I’ve done my fair share of travel with my kids, but I kept jotting down notes while I read the manuscript.